Water Bottle Carrier - The collapsible bottle holder is in the front pocket of the pack and can be used on any regular sized bottle. When not in use, the pouch can be easily stored away by folding it back into the pocket. Large Storage Space - Fit everything you need into one convenient location for quick access. Hold all of your personal items such as a smartphone, cash, credit card, keys or wallet safely in one place. Cable Port - Enjoy hands-free music with an iPod or smartphone secured inside the waist pack. Simply insert the earphone cable through the port opening to connect it directly to the device. Dog Leash - Included is a FREE elastic bungee style leash that can be hooked onto the built-in metal D-ring on the straps of the waist pack. It is perfect for walking with small to medium sized dogs. Adjustable Belt Size - One size fits most. The belt strap can be made longer or shorter to accommodate waist sizes from 21 to 55 inches. Safety Features - Designed with neon green and silver reflective materials for added visibility during night walks. 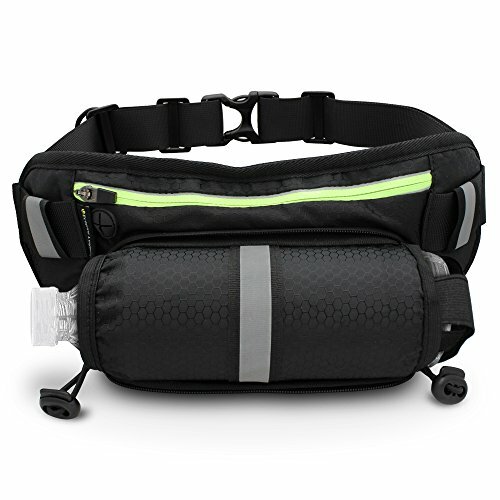 Multiple Uses - Whether traveling on an overseas trip or just walking your dog around the neighborhood, this slim profile waist pack is everything you need in one compact bag. Be assured that whatever you are doing and wherever you are going, your most essential personal items will be protected with you, so you can enjoy your activities with a peace of mind. If you have any questions about this product by LE Eclipse Legend, contact us by completing and submitting the form below. If you are looking for a specif part number, please include it with your message.